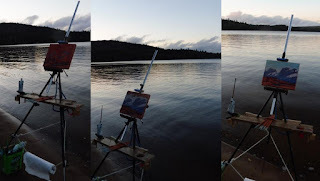 Phil Chadwick's Art: #2009 "Algonquin Rock Lake Turbulent Sunrise"
#2009 "Algonquin Rock Lake Turbulent Sunrise"
I quietly got up from my shoreline campsite at Camp B on Rock Lake. I parked at the trail head for Booth's Rock Trail. The cold front that had brought the heavy rain just as the presentation had ended the previous evening, had also brought in much colder air. The temperature was only plus 4 Celsius which explains why I was a bit chilly overnight. There was an excellent attendance at the "Art and Science of Tom Thomson" presentation and some of my good patrons and friends even came. The first strong cold advection of late summer can really change the landscape. The autumn colours were even starting to show through the green of the trees. Arctic sea smoke was boiling off the warm waters of Rock Lake. Turbulent stratocumulus clouds were billowing over the ridges in the strong northerly flow. 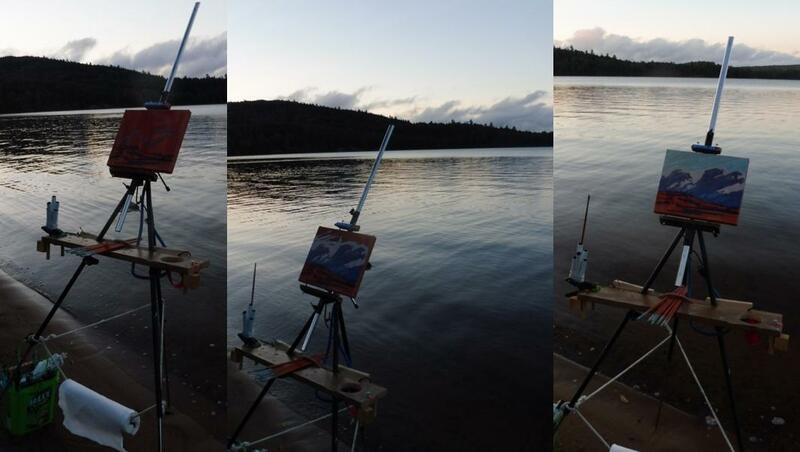 I knew I had to get out of the wind in order to paint so I set up on the sand beach to the lee of the ridge. It was cold enough to see my breadth. My hands did get cold and that prompted me to work quickly. Pine seeds were blowing in the winds and getting mixed into the oils where I left them. They added texture to the paint. This view is looking southeastward to the eastern shore and high ridges of Rock Lake. I listened to some wolves howling just as the sun was coming over the ridge. The barred owls were also still vocal. A family of pure bred black ducks and some common mergansers kept me company. Apparently a population of mallards were cut-off around Algonquin during the last ice age. These "mallards" lived in forests and evolved into the black duck we know now. With the receding of the last ice age, mallards are now inter-breeding with these black ducks. Pure bred blacks like I witnessed are getting fewer and more difficult to find. When I got back to the campsite all of the campers were in their winter coats and wearing togues. I was still dressed for summer.